[map] [street view] In Baldwin County. At the end of Ard Road, just south of CR-64 & I-10. Co-located with WEAR-DT, WHBR-DT and WFGX-DT; FM stations WKSJ, WDLT and WBLX. AUX:[map] [street view] West of Gonzalez, Florida, near the intersection of Muscogee Road and CR-97. Beam tilt ERP 100 kW. AUX: 100 kW @ 499 feet. 60 dBu protected contour map, from the FCC. Like all of the stations on the big Baldwin County sticks, this station covers all of the Mobile and Pensacola metro areas. [Picture] Screenshot of RDS text display on an Insignia HD portable, showing incorrect PI (call letters) and Radio Text fields. Started in 1965 as WCOA FM, companion of WCOA AM. The format was beautiful music. Later it was automated top 40 as WJLQ (Q-100), then live top 40 with the same calls. Somewhere in there they morphed into the Super Q. May have done urban AC for a while, too. Early on it was a Pensacola only station, but it moved to the 1,800 foot WPMI-TV tower along with a few Mobile stations back in the mid-80's. In the mid 90's new owners changed it to WWRO and brought in the rock classics as ARRO-100.7. Early in September 2000, the station flipped from its longtime classic rock back to CHR with calls and fomat of its previous foray into top 40: Q 100 and WJLQ. Q 100 focused more on Pensacola while company stablemate WYOK (as "Hot 104") targeted Mobile and WABB's dominance in that market. The station eventually morphed into hot adult contemporary. The tower that held WPMI-TV, WHBR-TV, WJLQ-FM, WKSJ-FM, WBLX-FM and WYOK-FM fell in 2004 during hurricane Ivan. The stations have since relocated to alternate tower facilities in the same general area of Baldwin County. On 3 November 2009 the station stunted with clips of classic country and oldies songs. Two days later they re-entered the CHR race as "i100", once again going after WABB. Like the first attempt, this was met with little success. At the end of August 2011, the station stunted again, this time with TV theme song clips. On Friday 2 September 2011 at 2 pm sharp the station debuts its new 80s and 90s pop variety format as "Journey 100". The Journey was short, and it eventually led to talk radio. 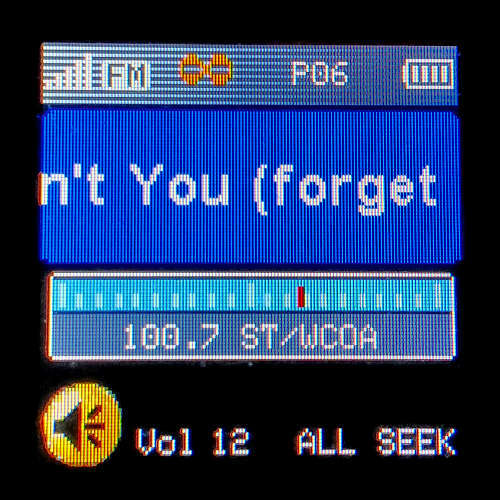 On Monday 23 April 2012 the station dumped the variety hits format for a simulcast of WCOA-AM, with the FM branding "Newstalk 100 WCOA-FM", bringing the original calls back to the station. Rather than stunt, the station made a quiet change right at midnight. On 28 February 2014, with no advance warning, Cumulus dumped the sorta-simulcast of WCOA 1370 for a stab at classic hits, as Jet 100.7. The call sign changed to WJTQ. Since debuting, the station has been wrought with technical issues, broadcasting one channel of stereo audio over both channels, as well as dropping RDS and HD broadcasts. The HD and RDS returned in late April, but the audio was mono for a longer period of time. Eventually the gremlins were banished and stereo returned, sans HD. The RDS disappeared (or, rather, appears to have been lowered to a point where most radios won't detect it) in September 2017.